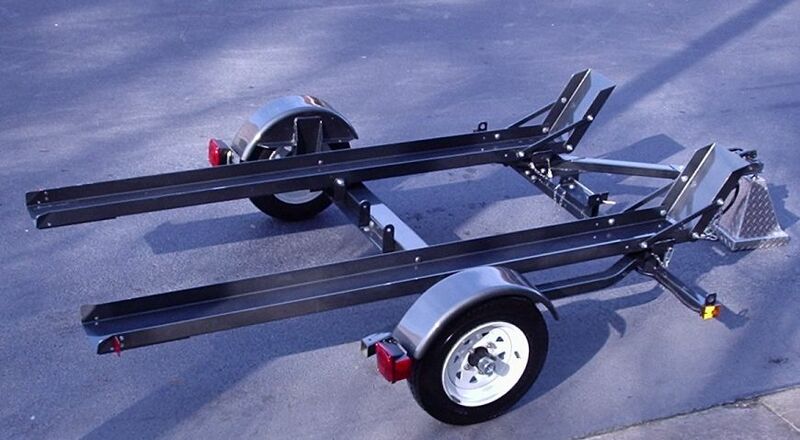 MS-1 Motorcycle trailer from MotorSport Trailers, Inc.
Regrettably, due to the impact of the poor economy, we have ceased production of the MS-1 trailer. We continue to monitor the economy and interest in motorcycle trailers and when and if interest rises to the point where we feel it is financially smart to resume production we will, but until then the MS-1 is not available. I am a Kendon dealer and drop ship trailers from their production facility all over the United States and can often beat the price of other dealers enough to make it worth your while to give me a chance to earn your business! Write me, tell me what you are interested in and give me your zip code so I can get you a shipping quote. Taking a few minutes to do so might save you several hundred dollars! Designed by riders for riders! these are specifically what the MS-1 motorcycle trailer was designed to handle. Note: We also carry Kendon motorcycle trailers and can often offer you a much better deal on a Kendon than you will get through other Kendon dealers. Ask for a quote to see how much we can save you on a Kendon trailer. Our discounts are substantial. For more information on the Kendon line of motorcycle trailers, go to the bottom of this page and click on the Kendon image. The MS-1 is a high quality motorcycle trailer that is easy to load, tows great, is light weight, properly hauls one single bike or two, and will stand up out of the way in your garage when you are not using it! It was designed by a seasoned rider and incorporates features that only a long-time rider would know to incorporate into a trailer. - then keep reading. The MS-1 motorcycle trailer may well be just what you need! Rather than utilizing a normal loading ramp, the rails tilt making loading very easy. As the bike's weight moves forward, the rail gently rotates into its final position. Your feet remain on the ground throughout the entire loading process. If you would like to see a video of the loading process, go to www.MotorSportTrailers.com/mpeg.html. Two bikes can easily be loaded within 10 minutes and you can be on your way! Once underway, you could easily forget you were towing a trailer were it not for seeing bikes every time you look in your rearview mirror. The trailer utilizes a high-quality torsion axle which provides much more suspension travel and better compliance than traditional leaf spring suspensions, gives each wheel its own truly independent action and provides your precious cargo a much smoother ride. Furthermore, due to the MS-1's design characteristics, it tracks like a heat-seeking missile. You will find that it has no tendency to wander or dangerously oscillate like some trailers. From a manufacturing and quality perspective, again the MS-1 is not at all typical. It is manufactured entirely in the United States by an ISO Certified high-tech manufacturing company utilizing Computer Numeric Controlled (CNC) equipment to assure that every bend, cut and hole is exactly where it is supposed to be. Once parts are formed, they are properly cleaned, prepared and powder coated with a beautiful high-gloss black finish. This process not only assures a long-lasting beautiful finish; it assures that your trailer is well protected from the elements for years to come. Don't just take our word for how great the MS-1 is. Look at what our customers have to say and see some of their bike / tow vehicle combinations. Please be patient while the images load. They are all there and will load if you wait. Still doubt that the MS-1 is as good as we say it is? Click here to read what Motorcycle Consumer News had to say in a September 2002 review. (Note: Motorcycle Consumer News is very similar to Consumer Reports in that they accept no advertising and are known for their unbiased reporting on motorcycle related matters. MCN, staffed by serious motorcycle enthusiasts, is widely accepted by veteran riders as a very reliable source of relevant information. The original article was captured as an image and is therefore very large. Please be patient while it loads. For more information about MCN, you can visit their website at www.mcnews.com. This product review is published with the permission of MCN. * Rail extension for loading bikes with wheelbases over 60"
The MS-1 is shipped to you via UPS or FedEx in eight boxes and can normally be assembled in one day. If you would like a firm shipping quote, please call or send us a note at the email address shown at the bottom of this page and include your zip code. Each customer receives both a Bill of Sale and a Manufacturer's Certificate of Origin and each trailer has a proper VIN tag affixed to it. All three of these items are typically needed for you to get a license tag for your trailer. What if your bike is too large for the MS-1? If you have a very large bike such as a Harley Davidson Road King, Harley Ultra Classic or Honda Goldwing we recommend the Kendon line of trailers. As good as the MS-1 is, no one trailer can serve all needs. The MS-1 is designed specifically to handle one or two bikes up to a maximum weight of 750 pounds each and with wheelbases of up to 65 inches in length. As an authorized dealer for Kendon trailers, if you have need for one, we would love to earn your business. We are extremely customer service oriented and we know more, by far, than most dealers about motorcycle trailers and which trailer will fit your needs best. Please contact us for a quote before buying elsewhere and give us a chance to delight you!